In May, engineers, pilots, researchers and scientists will convene in Bordeaux, France, for ESA's 71st parabolic flight campaign. 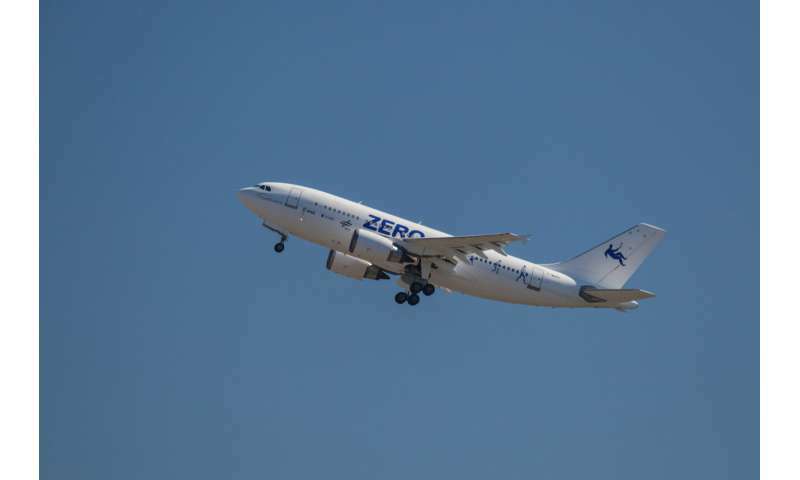 Over the course of three days they will fly on a specially-fitted commercial aircraft, testing equipment and running research as the pilots put the plane through repeated parabolas, giving the passengers and their experiments brief bouts of microgravity. Classified as a test flight for safety reasons the parabolic flight campaigns mostly fly over the Atlantic Ocean and have been running for decades to offer researchers hands-on access to their equipment and test subjects in weightlessness. "Novespace, the company that runs the flights, prepared the plane by removing half the seats, adding safety padding, and installing mechanical and electrical connections for the experiments," says ESA's project coordinator Neil Melville, "It isn't really any different from a normal airliner, apart from the special way it is flown, needing a well-trained safety crew and three pilots simultaneously to fly parabolas. We always bring an interesting diversity of science on board, and this campaign promises to be no different with experiments on how our spines cope and how we judge distances in weightlessness, as well as testing experiments that will also fly to the International Space Station." Stiff back? Astronauts in space know the feeling. They have reported increased spinal stiffness in space and on the Moon. It is possibly due to the back muscles contracting to keep the spine in place – the muscles kick-in to take over the job of gravity on Earth. 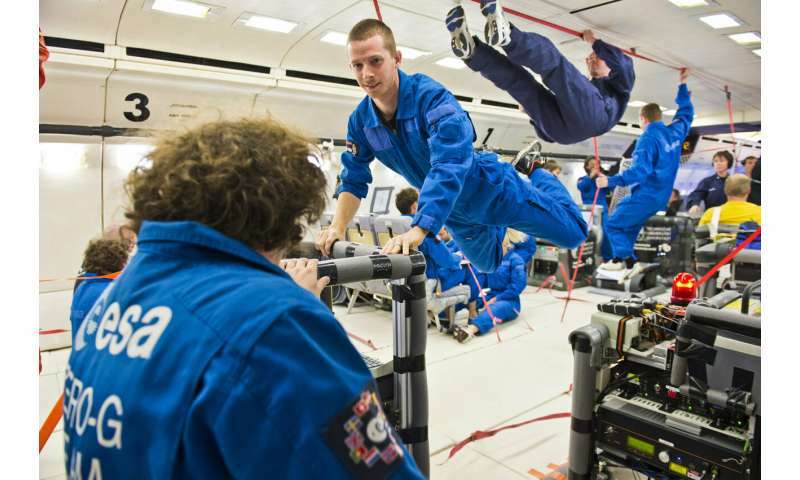 On this campaign an experiment will measure the curvature of the spine in test subjects as they undergo the repeated parabolas inside the aircraft, enduring both weightlessness and hypergravity during the pull up phases. The research will help us understand back pain off Earth and at home. Shake a packet of cornflakes and the smaller flakes will fall to the bottom. But how do granular physics behave in weightlessness? One experiment will vibrate granular media to see how they behave and create better computer models of the phenomena. Other experiments will look at testing heat pipes for possible use in spacecraft to keep them operating at the right temperature. Without convection to make heat dissipate other cooling mechanisms must be used and designing spacecraft to work in the extreme temperatures of space is always a priority. 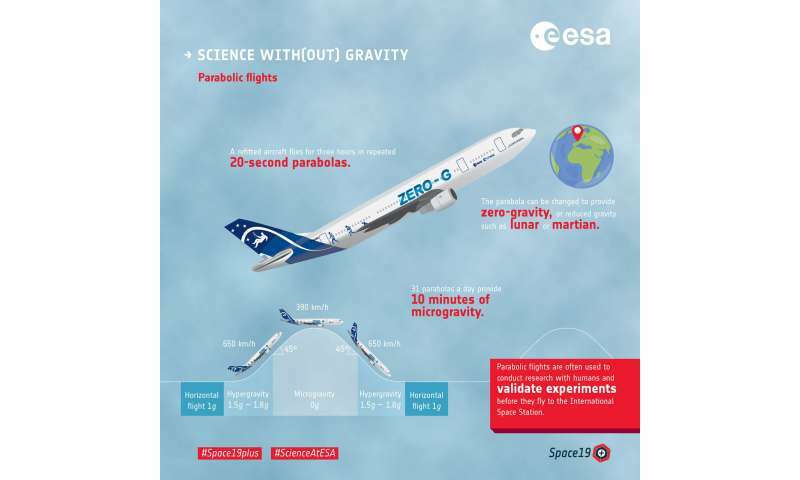 Parabolic flights are one of many platforms ESA offers for European researchers to run experiments for spaceflight. These flights are one of the few that allow the researchers to interact with their own experiments "hands-on" in a weightless environment. Send a proposal through our continuously open research announcements and you could be flying on the next campaign.